Chun In-gee clinched the Evian Championship in record-breaking style Sunday, winning by four shots to secure her second major with the lowest ever 72-hole score in a major. The 22-year-old South Korean sank a difficult 10-foot putt to finish on 21 under, breaking the record for men and women of 20 co-held by Henrik Stenson and Jason Day. She bettered the women‘s record by two. 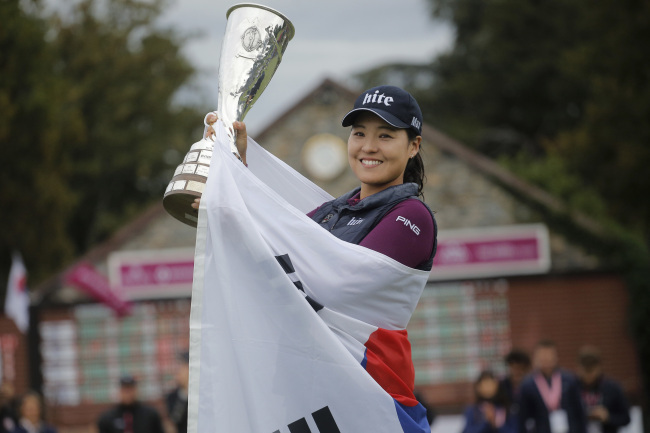 She led from start to finish, although she did share the first-round lead with Park Sung-hyun -- who finished tied for second with Ryu So-yeon in a dominant tournament for South Koreans. Chun finished the day with a 2-under 69, the most modest of her four rounds. Not that it took anything away from her achievement. Chun missed the cut here at Evian Resort last year and tied for 65th in 2014. In four days of intensely accurate driving and clinical putting, she was near-faultless. Her only significant blemish was a double bogey on the ninth hole in the third round -- and even then she limited the damage having opted for a two-stroke penalty. There was one bogey Sunday, on the 14th, but she made a birdie on the next to move back to 21 under and almost added another birdie on the 16th, with her attempt stopping just short. Chun, who won the US Women’s Open last year, is only the second player in LPGA history to have her first two LPGA wins come at majors. The other was countrywoman Pak Se-ri in 1998. It looked like she might miss out on a new major record when she sent her tee shot into the left rough on the 18th. She chose the safe option and used a wedge to chop her way onto the fairway, about 95 yards from the pin. Then, she sent her ball over the water to give herself a decent shot at history. ``I was so nervous. So my caddie David Jones told me `if you make the par, I buy the dinner,’‘’ Chun said. After making her record-breaking putt, she raised both arms in the air and smiled. She did not see what was coming next, however, as defending champion Lydia Ko poured Champagne over her. Shanshan Feng, China‘s only major winner, was six shots back in fourth place, with South Korean Sei Young Kim posting an impressive 65 to move up to fifth ahead of countrywoman I.K. Kim. American Angela Stanford was 11 shots behind Chun in seventh spot. It was a tournament to forget for Ko. Chasing her third major, the 19-year-old New Zealander finished in a tie for 43rd at 2 over. She did enough, however, to win the third edition of the Rolex Annika Major Award -- rewarding the player with the best combined record at all five majors and named after 10-time major winner Annika Sorenstam. ``For (Sorenstam) to be here and for her to be able to present the trophy to me makes it even more special,’‘ Ko said. Ko won the ANA Inspiration in April, where Chun was tied for second. That tournament was Chun’s first start after a month out with a back injury caused in bizarre circumstances. She was struck by a hard-case suitcase that rival South Korean player Jang Ha-na’s father dropped down an escalator at the Singapore airport. Chun, who has nine wins on the Korean LPGA, started in pouring rain in the morning.